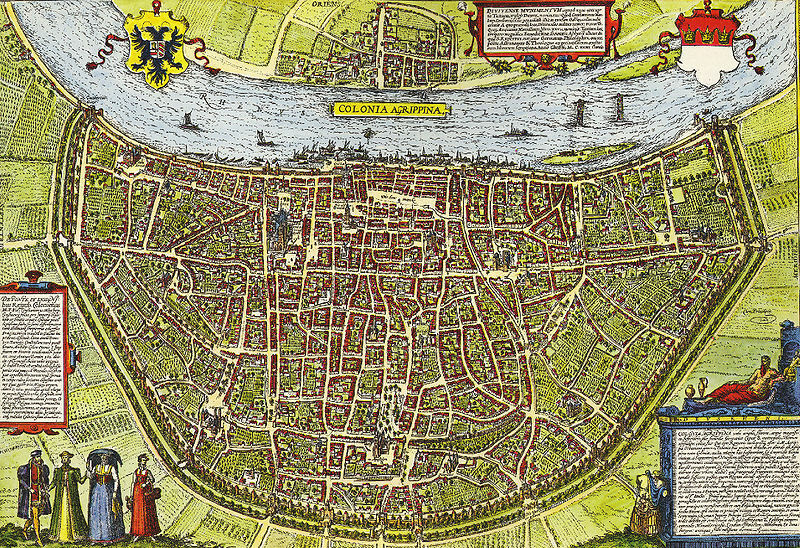 By the beginning of the twelfth century, German cities had become important players in the investiture conflict. Their role not only included being used as fortifications and military bases, but their residents often had to choose between supporting the Papacy or the Holy Roman Emperor. In 1114, the citizens of Cologne, together with their anti-Salian archbishop, joined a large opposition group on the lower Rhine against the emperor, Henry V, and fought against his army outside their city walls. One account of this battle comes from The Greater Annals of Cologne, which was first written around 1175. Remembering his dislike for the people of Cologne, the emperor got together a great army of Alemannians and Bavarians and of Saxons, under their duke Lothar, with the purpose of reducing to shame and insignificance this most flourishing among the cities of France and Germany. He first attempted to take and destroy the fortified town of Deutz, so that by stationing a garrison at this point he could cut off the people of Cologne from receiving anything by water. As soon as the people of Cologne heard of this, they called together under their standard great numbers of their most valiant young men, crossed the Rhine with a strong force of bowmen, and, drawing themselves up in battle array, awaited the attack of the emperor with stout hearts. When the emperor observed their bravery he took counsel with his followers and determined to draw out the battle until evening, when the enemy, supposing his troops to be worn out, would begin to withdraw and so be the more easily overcome. In the meanwhile the cavaliers of both sides had a free field and rode against one another as if they were taking part in a spectacle; but when a great cloud of arrows came showering in from the side of the Cologne people the knights of the enemy fell dead or wounded. There was in the emperor’s army a corps whose armor was made of horn and so could not be pierced by iron. When these removed their armor, however, in order to get a little air, for it was very hot, they were immediately covered with arrows, and all but six fell on the spot. When the emperor saw that the enemy did not give way but steadily held its own, he decided that he would yield the field, since the position proved ill chosen, and accordingly retreated that night behind the Wagenburg. The next day he directed his army against Bonn and Julich, two fortified places belonging to Cologne, and plundered and burned everything within reach. On his return, Archbishop Frederick, Duke Gottfried of Lorraine, Henry of Zutphen, and Count Theodoric of Are intercepted him with great bravery, but in vain, for some of the most distinguished on their side – Count Gerhard of Jiilich and Lambert of Mulenarke – were taken prisoners, and Eberhard of Gandernol, a valorous man, was killed. But when Count Frederick of Westphalia and his brother Henry came up with heavy reinforcements the emperor was forced to give way and barely escaped the pursuing enemy by flight. For the third time the combatants met in a great engagement on the plain of Andernach, nine miles from Cologne, and here the people of Cologne won the victory, as is their wont. The emperor had under his standard a very strong force, footmen as well as cavalry, made up of Saxons, Franconians, Alemannians, and Bavarians, as well as valorous knights from Burgundy. He appeared before Andernach with this mighty host, but proposed to fight the battle with the help of his dukes, for he himself took no part, but awaited the outcome of the conflict at a little distance. Then appeared the ranks of Cologne in battle array, far fewer in number but nowise inferior in bravery, under the leadership of their duke and archbishop, Frederick, and of the former Duke Henry of Lorraine, Count Theodoric of Are, Count Henry of Kessel, and others equally valorous and well versed in war. In the first onset Duke Henry, with a small detachment, rushed upon a far superior mass of the enemy, but was forced to retreat to his camp. Then amid a frightful din of trumpets both armies, eager for the conflict, set upon each other, and for a long time the struggle remained undecided. At last the chosen youth of Cologne, in a wild rage, resolved either to conquer or die, and began to slash about them with fearful effect, so that the enemy was compelled to flee. Then Count Theodoric, a brave knight to whom the victory was chiefly due, since he had pressed forward with his followers against the enemy like a lion, began a fearful slaughter on all sides. Many free men of knightly rank were killed or taken prisoners. Duke Bertolf of Carinthia, a faithful adherent of the emperor, was captured and taken in charge by Count Theodoric himself. None of the leaders on the side of Cologne were either killed or captured except Count Henry of Kessel, an excellent man, who, through the turpitude of his followers, fell under the horses’ hoofs and perished. He was honorably buried in Cologne near the cathedral of St. Peter. This entry was posted in Primary Sources and tagged 12C, Germany, Holy Roman Empire. Bookmark the permalink.